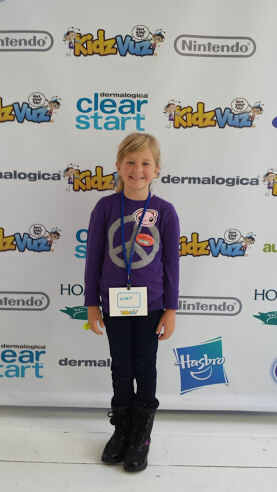 Yesterday my daughter and I had the opportunity to attend the KidzVuz Holiday event in New York City. We braved the extremely cold weather and took the train into Manhattan to check out this holiday kick off event, which was hosted in a loft. My daughter was excited because I told here there was going to be all sorts of toys, food, and fun things to do there. My son however declined to go with us a decision he would later regret. We arrived at the event in the early afternoon and were happy to see that many other people decided to get out in the cold and join us. Let me be clear the event was held indoors (at Gary’s Loft NYC) but it was cold getting there and back that was a little annoying. Once we were there it was nice and cozy and warm and KidzVuz really set things up nicely. What is KidzVuz? KidzVuz is a totally safe video review sharing site for kids age 7-12. It’s the ONLY online destination exclusively dedicated to letting tweens have their say and share their views about the stuff they love. Check them out by clicking the above link. Kids can register on their web site or app and upload videos of their product reviews. At KidzVuz holiday event (follow hashtag #KVHoliday) there were many hand-on activities for the children and adults as well. 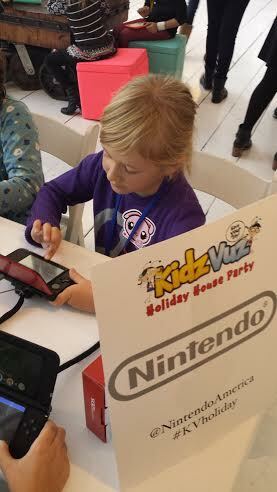 There was a Nintendo game lounge where kids could play the latest game systems from Nintendo. 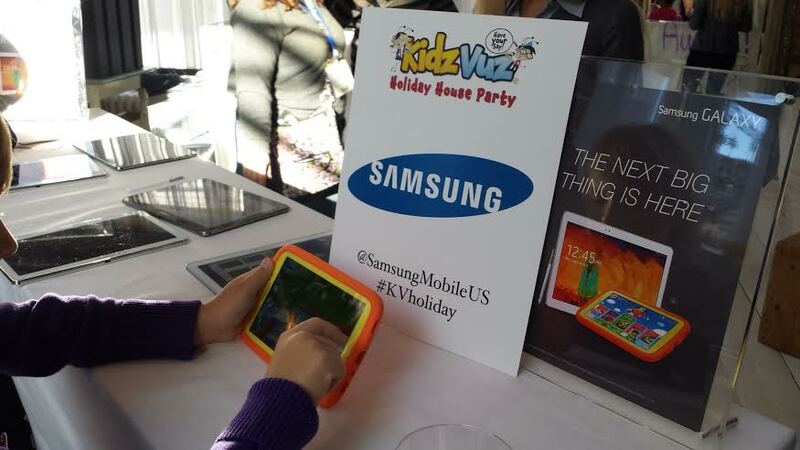 There was also a Samsung Kids Kiosk area, which had the latest kids tablets, and adult tablets as well from Samsung. I was particularly impressed with the Samsung Galaxy 10.1 Tablet. The design was really sleek and fluid. The girl running the kiosk told me it was one of their best tablets ever. I would love to get my hands on one of them for the holidays (hint, hint). My daughter had fun playing with the Samsung Galaxy Tab for Kids. It is a really kid friendly tablet that is no joke. 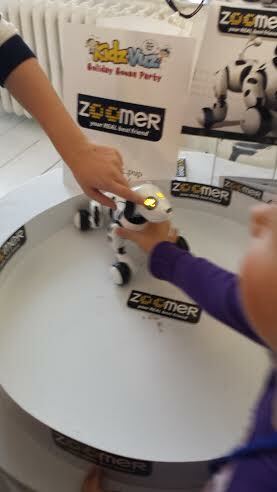 Also featured at the KIDVUZ event was a play area featuring toys from Hasbro and Spin master. My daughter and I saw this Zoomer pup. It suppose to mimic the movements of a real dog, and you can even teach your puppy pal tricks, such as sit, play dead, roll over and more. The pup was very cute and we tried to tell him different commands but for some reason he did not respond to any. My understanding he was either low on batteries or it was VERY loud in the room that he could not hear us. While the kids played and the adults smoozed Fuzipop laid down some pop beats with the DJ Kai song for everyone to enjoy. Oh my gosh they played this song “What does the Fox say?” and all the kids went crazy. This song is already driving me nuts but my kids are still loving it. 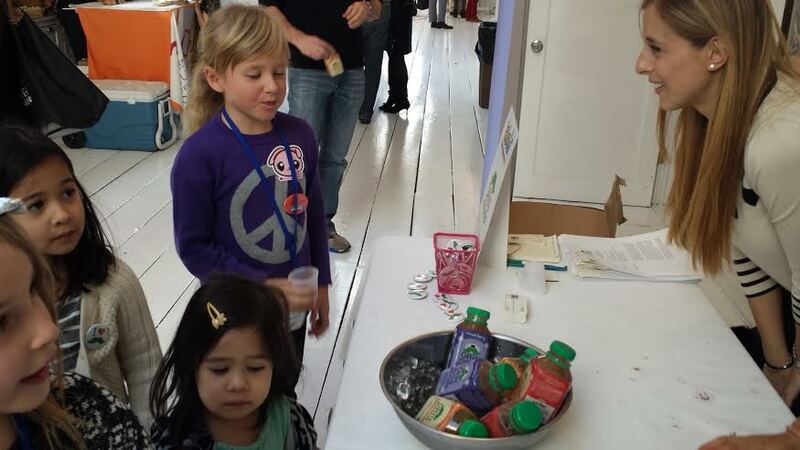 There wasn’t just toys and gadgets at this event there was also snacks and smoothies. 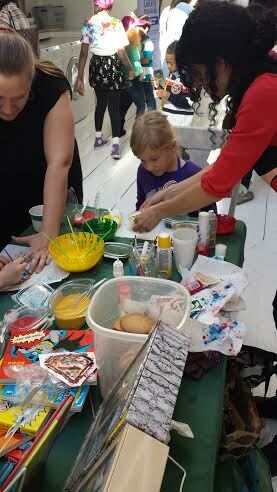 There was this one table where the kids could design and make their own cookies. This craft was provided by Downtown Bookworks. 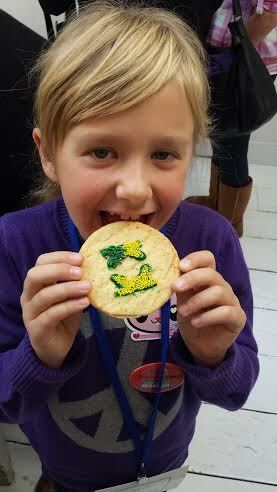 Victoria did a Green Lantern cookie, which she quickly devoured. A company called Green Mustache provided delicious healthy smoothies. They make fruit and veggie juice smoothies for kids. The line of organic, non-GMO, preservative-free, no-sugar-added fruit and vegetable juice-smoothies. An interesting name for a smoothie I must say. And after eating all of the sweets there was a company called Dermalogica handed out samples of their teen skin care products. After a couple of hours of having fun checking out all of the toys and gadgets and snacking on some delicious food we were about ready to go. 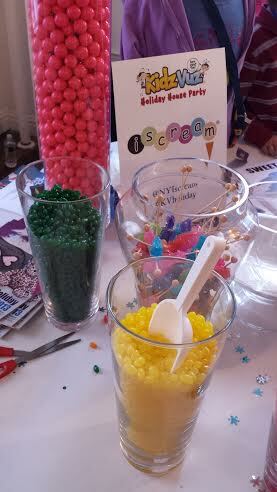 There was a candy table at the event called iSCREAM and I let my daughter make up a small bag of candy to take with us. We usually don’t let our kids eat candy but once in a while is ok. On the way out of the event my daughter was given a gift bags to take home her. 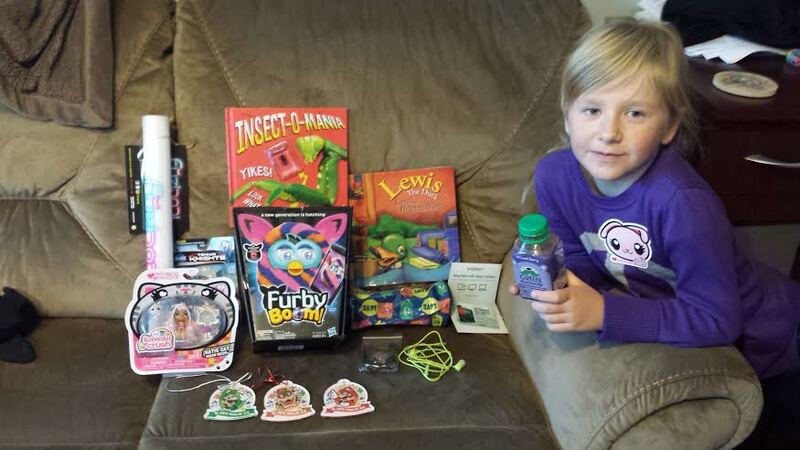 Hers contained some of the latest toys and a bunch of other fun things. When we got home my son took one look at the goodie bag and was like, “where’s mine?” To that I replied you should have come. Of course I saved one little toy for him but he missed out on the big stuff like the newest Furby! Oh well as they say you snooze you lose. Maybe next time he will venture out with his Mom and sister and have a great day with us. Kudos to Kidzvuz for throwing an awesome event. Lots of great info for me and my kids. Now, I’m off to convince my husband that I need the Samsung Galaxy Tablet! « Fairy Tale High Dolls – Are more than just dolls-with ebooks and webisodes! THAT LOOKED & SOUNDED LIKE A GREAT EVENT. THE GIFTS WERE AWESOME .